A business novel which follows the life and fortunes of a manufacturing plant manager as he learns to implement lean manufacturing, saving both his plant and his career. 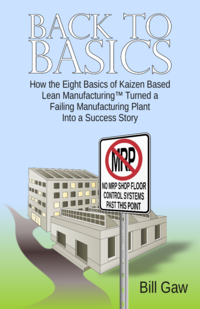 Through the plant manager's story, you'll learn not only how to implement lean principles but, more importantly, how to make them work, practically and successfully. In today’s competitive manufacturing environment, it takes more than quick fixes, outsourcing, and downsizing for companies to consistently achieve their growth and profit objectives. While many elements of these basics have been documented and presented in hundreds of management articles, books, video presentations, and seminars, their fundamental relationship and synergistic importance to achieving growth and healthy profits has not been effectively defined and communicated. This book changes that. It demonstrates what to do, how to do it, and when to do it within the story of a plant manager who turns round both his failing manufacturing plant and his own career. Bill Gaw is the founder of Business Basics, LLC, and is a firm lean business advocate. He is the developer of seven lean management training packages and eight training modules published to help individuals and companies realize their full growth and earning potential. Bill Gaw’s lean management experience spans more than 35 years, over which time Bill has held positions as a shop expeditor, business planner, buyer, manufacturing manager, vice president, president, and lean­management consultant and educator.